When building a bridge to the future, it’s important to know where we’re going and how much it’s going to cost. Nowhere is this principle more important than in the current discussion underway in Florida about how to plan for climate change, which is why we are pleased that Governor Ron DeSantis has committed to forming an Office of Resilience & Coastal Protection to address climate impacts such as sea level rise. Thankfully, a bill introduced this session by Democratic state Rep. Ben Diamond from St. Petersburg will put some meat on the bones of the governor’s promise. The bill outlines a process to consider the causes and effects of climate change and to make recommendations on how to best mitigate impacts in a quadrennial report to the governor and state legislature. Most importantly, it requires Florida to account for current and future costs from climate impacts. This cost accounting provision would make Florida one of the first states in the country to provide taxpayers with a transparent look at just how much it’s costing to adapt to climate change. Beyond being the smart thing to do, the right to know the cost of climate change is something all taxpayers should support. Right now, Floridians are paying way more for climate impacts than they likely understand. Most people’s understanding of the human and financial toll of climate change is shaped by extreme weather events like Hurricanes Irma and Michael — and rightfully so. According to NOAA, Irma cost approximately $50 billion in damages, with Florida contributing to the largest portion. And most recently, Michael, the third-most intense hurricane to make landfall in the contiguous U.S., hit Mexico Beach and took 43 lives. However, the day-to-day costs of climate change and the resiliency efforts required to mitigate the impacts are equally significant – and will likely far surpass the financial cost of hurricanes. 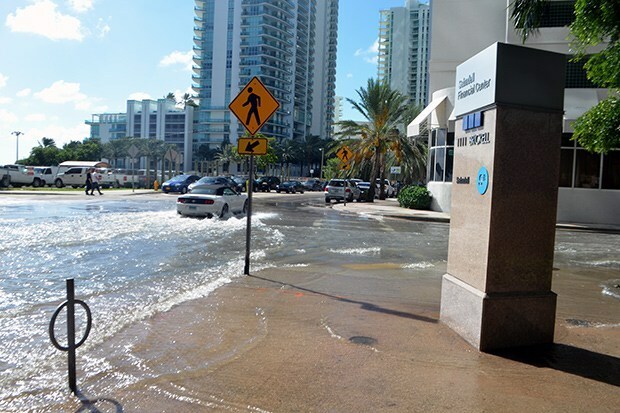 Rising sea levels, extreme heat and increased rainfall are pushing aging infrastructure to the brink, resulting in costly collateral impacts that require big investments, such as sunny day flooding. For example, Miami-Dade County is spending $600 million this year in operating expenses on climate change mitigation and resilience, including monies for sea level rise-related infrastructure projects plus flagging $16 billion in unfunded projects for sea level rise related infrastructure upgrades over the next five years. It’s not just Miami. In the Florida Keys, some early projects to raise roads are costing from $3 million to $7.5 million per mile of thoroughfare replaced. Delray Beach will have to pay over $378 million to protect its neighborhoods from chronic flooding. According to Broward County’s Chief Resilience Officer, the county will spend nearly $6 billion to erect sea walls. A better understanding of climate costs would also help in solving the problem. A comprehensive accounting of climate costs will drive the conversation of who should be responsible to pick up the tab for the mess, revealing the true financial toll of the damages climate polluters like ExxonMobil, BP, Shell and others knowingly caused.